If you’re missing Percy Jackson, Harry Potter, or Hiccup and Toothless, Taran Matharu’s The Novice, might be a good next read for you. It has a unique, bullied protagonist, a fantasy school, and mythical creatures. It’s everything 11–13-year-olds like to read about in one book. Fletcher is our picked-on main character, who, through a series of unfortunate events, gets the chance to attend a school for summoning demons. Which apparently isn’t as evil as it sounds. Fletcher makes unlikely friends and gets into a lot of mischief (a la Harry Potter style). But other than his unique situation and friends, there’s really nothing all that extraordinary about Fletcher’s voice, which could be a good or bad thing depending on your reading preferences. If you like when the underdog wins, go into this one full throttle (not that the underdog necessarily wins). As for the plot of the book, it was interesting. The school idea was fun, and I never really knew where the plot was going, as there were many surprising twists and turns. I just didn’t expect this book to be so politically based. (And no, I don’t mean it touches on current politics.) The antagonists are very politically and economically motivated, whereas I was expecting more action and adventure for our protagonist to respond to. It’s part of the reason I knocked the book down a star rating. 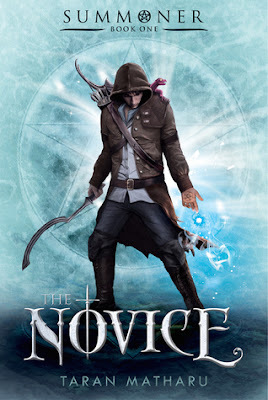 Like I said, this book is definitely for fans of Harry Potter, How to Train Your Dragon, and Percy Jackson. It’s got all of the same key elements with some fun twists of its own along the way.